Avid Scorch for iPad in the classroom – Having nothing to say and saying it: my blog. Avid released their first iPad app only a few weeks ago, and it’s for my favourite ever software title – Sibelius. In fact, Avid Scorch is much, much more than a Sibelius file-reader for iPad. If it weren’t enough to be able to read and play back your Sibelius files, what about being able to perform some score-wide edits, like balancing the playback of the instruments in a mixer, or transposing a score to fit the range of your voice? You can change the tempo (perfect for practicing parts directly from the iPad with playback – more on that in a minute), view the notes being played on an interactive keyboard, change the font, the look and feel, and use a unique music-stand view which leaves you with the music and nothing else, so you can easily play along right from the iPad screen. And you can change the instrument of the staff you’re looking at – even from traditional notation into guitar tab or vice-versa! Read Daniel Spreadbury’s take on it here. Now this is a cool tool for anyone who does their own compositions or arrangements in Sibelius. Your whole library can now be shared on the iPad, and I’m really interested in what the applications might be for teachers and students in schools who have bought class sets of iPads. Yes, those of us suitably inclined probably rather like the idea of taking our stage band on tour with their whole parts library on an iPad each. Need to change the set list at the last moment? No problem, you can drag the scores on your virtual shelves into any order! But if you don’t already use Sibelius, and therefore have lots of music in Sibelius format ready to go, you needn’t worry – Avid have thought of that, too. Scorch comes with a built in Store, where you can download literally thousands of scores ready-to-go, many of them free of charge. As a sample I’ve used an excerpt from my 2004 piece Jabberwock. This was a fairly crazy setting of Lewis Carroll’s poem “Jabberwocky” for combined school concert band and stage band and MLC School premiered it at the Sydney Opera House. You can watch a video of the performance and download the full score (which is also included in Sibelius’ Worksheet Creator, FWIW) here. You can download the excerpt from the score, so far not edited for iPad to play around with yourself by clicking here (further down you can download the same score iPad-optimised). The process to take the score onto the iPad is easy once you’ve done it once. And to make it even easier I’m providing House Style files you can download so you don’t even need to go through all these steps if you don’t want to or you’re in a hurry. In Sibelius, I’ve opened the excerpt from the original score. The page size for both score and parts is set to A4. If you try opening this in Scorch you’ll see that the dimensions of the iPad screen are wider and shorter than the A4 page, and your staff sizes are probably set quite small, meaning that while you may be able to read them, you might struggle to perform from them. If you change the page setting to the US Letter standard size those dimensions work better on iPad, but you can get even better ones which will fit exactly when in Music Stand mode. 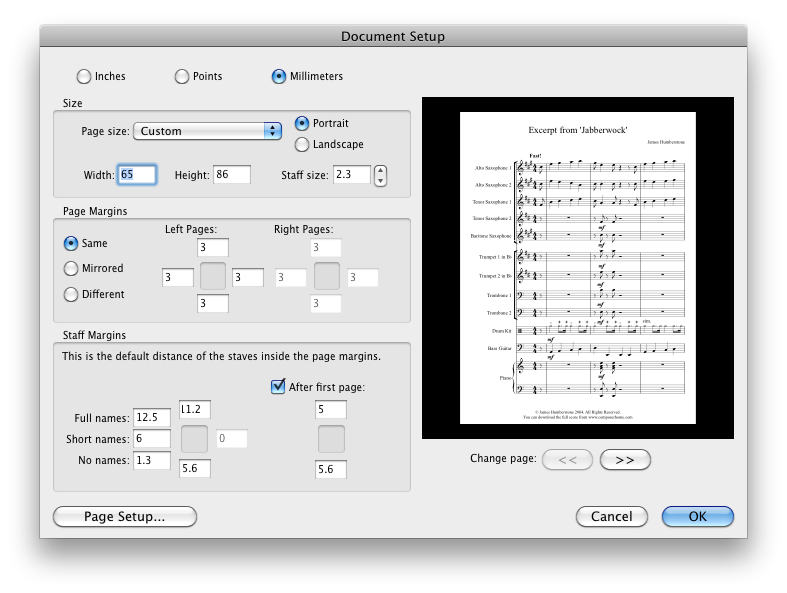 In Sibelius, go to Layout > Document Setup and change the sizes to the ones you see to the right, including margins. Once you’ve done this, go to Layout > Optimize Staff Spacing in case it has created any clashes between the staves in the score. Review your score, and if staves seem too close or too far apart, make the Staff size bigger or smaller by going back to Document Setup. Next, you should open the parts Window (Window > Parts). Click on the Multiple Part Appearance button, and under Document Setup set the same values by choosing “Same as score” under both Page size and staff size, and then clicking the Margins button to edit the margins. Again, review the parts as you usually would, looking for clashes and considering making the staff size bigger, especially for younger players. 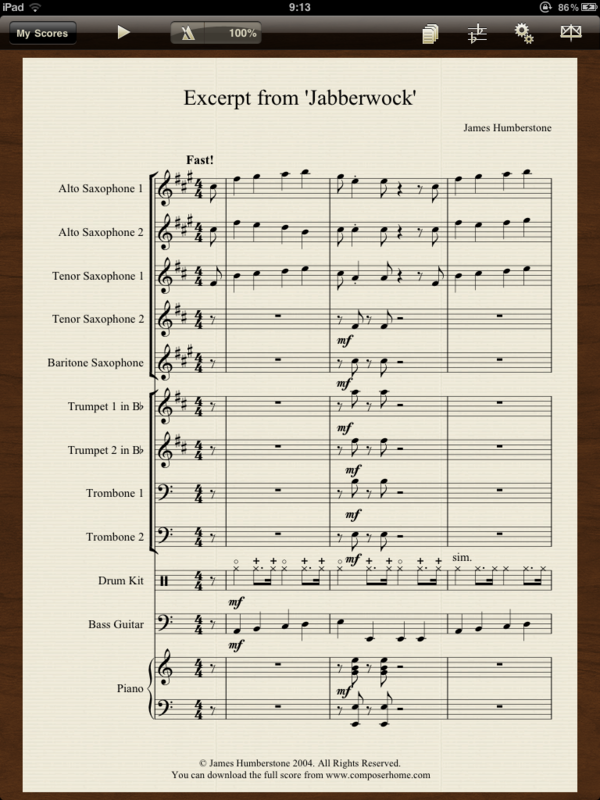 You can download the Jabberwock score here with these dimensions set up and see how nicely it works. Once you’re in the score, just click on the parts list, press play, and you should hear the whole band playing while you play your part. Open the mixer and mute your part to play karaoke-style! If changing all those values in Sibelius seems a little complicated, you can make it easier by using the House Styles I’ve created to do it quickly – download them here and here. For instructions on how to import them into Sibelius, go to the Help menu, open the Sibelius Reference, and read page 656 under “User-editable files”. Once you have imported them successfully, in your score go to House Style > Import House Style and choose iPad as seen on the left. 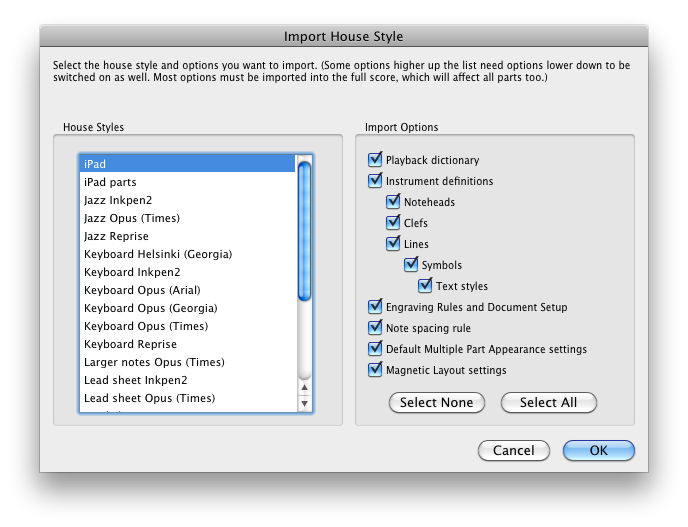 As before, run Layout > Optimize Staff Spacing and check your score for any resulting clashes, then go to Multiple Part Appearance in the Parts Window and this time click on the House Style tab, then click the Import House Style button and choose the iPad parts House Style. A quick proofread of your parts and you’re ready to go! There will be a whole host of other things you could do with Avid Scorch in the classroom. Let’s consider how useful the transpose feature is for vocalists needing to sing in-range. Or what about score study for senior students? Delivering folders of scores to students using Dropbox? Composition progress diaries online with linked Sibelius files for reading in Scorch (if you’re reading this blog on your iPad, you should be able to open the linked Sibelius files in Scorch seamlessly). Comment below! I hope Avid Sibelius will consider creating a “Panorama”-like mode for plain score viewing and playback on Avid Scorch, as well as a “Focus on Staves” feature. Why don’t you write to them and suggest it? You can kind of do Focus on Staves in that you can switch to any part (and a part can have any combination of staves in it, of course), so you’d just have to set up what you need in advance. Someone else was suggesting annotation tools – I think sending Avid/Sibelius your ideas is a great idea, they’ve very receptive. AVID Scorch can be a great tool for music teachers and students. I have few suggestions for music educators and students. 1. Piano Four-hands or piano duo pieces can be practiced without a partner at home by playing the other part in IPAD. 2. Most of the performers use page turners (human) during performance. AVID scorch makes page turning easy. 3. Students practicing voice or solo instrument can simulate their accompaniment in IPAD. This can help so much in practicing. 4. Scales and Arpeggios can be created using plugins available in Sibelius and can be used in IPAD for practicing. This can save lot of paper! Don’t forget about the choral implications for this application as well. I’ll openly admit that I’m a Finale user (I live in Minnesota, so you might as well support the company in your back yard) and that Finale has no iPad app. I’ve been making “do” using a PDF Music Reader (e.g. UnrealBook) as well as audio files generated by Finale as .aiff files for my own choir rehearsals (the PDF Music Readers can play audio files, too). Scorch can do most of this on its own, simply from a Sibelius file. With an external bluetooth speaker, such as the Jawbone JamBox, students could use Scorch in sectionals (provided that there was at least one iPad per sectional), turning on/off other parts as needed (and probably changing voice sounds to piano sounds, adjust volume of individual parts, and so on). And now that Sibelius 7 accepts and exports MusicXML files, users traditionally on Finale could easily transfer their files to Sibelius and vice-versa (some power users will mention that some data is lost in Music XML files, but in general, choral files transport pretty well). It’s possible that many choral users were attracted to the “simplicity” of Sibelius versus the “complexity” of Finale (This is how it was marketed–not my opinion), and here is a chance for them to bring those Sibelius files into rehearsals with their iPads. Choirguy, I’m already working on choral scores for Avid Scorch on iPad, seeing as how I’m in a large, prominent civic chorus in the Atlanta area and I’m a music copyist who uses Sibelius. I’ll be blogging about this a lot. Google me! We need to be able to edit our score on our iPad. Not just listen to it. 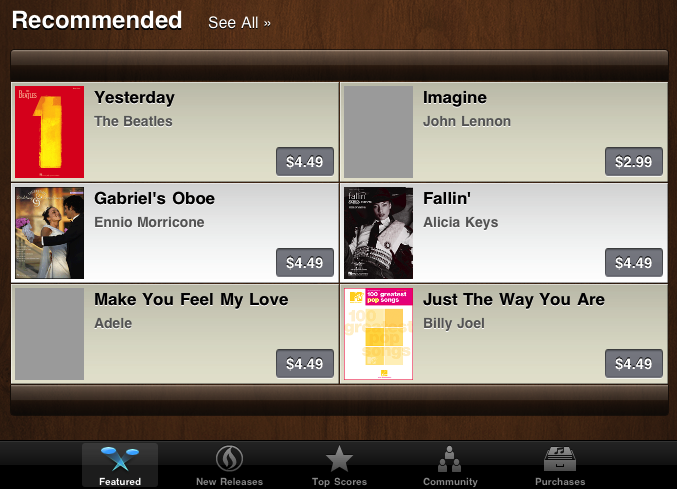 Then I guess you want Sibelius for iPad, not Scorch for iPad. It will be interesting to see if that comes one day. It would be a challenge to make it work with the touch screen UI, though – I’m not sure how it would work best. Hello. I recently purchased Sibelius 7 and have Scorch on my iPad (first one). I can’t open any files created in Sibelius 7 in Scorch. It throws up – “There was a problem loading the score”. I apologise for adding this here, but I can’t find an email link to Avid in Scorch for iPad support. There usually is a support link for app developers through the App Store, but none is available for Avid. Not good for Avid. I would be grateful if anyone can help. I noticed that Sibelius 6 won’t open Sibelius 7 files either, but this might be normal. It’s normal for an old version of Sibelius not to be able to open the new version. But as for Sibelius 7 files on Scorch for iPad, I would ask on the Sibelius chat page if you can, they’re really great at responding quickly there and if it has already been discussed someone will point you to the thread. Thanks for the advice and quick response. I have found the chat site and posted. This is where you should go to get help with Sibelius 7 and Avid Scorch. We’re working on making an update available to allow compatibility between Sibelius 7 and Avid Scorch so that you can open your Sibelius 7 scores. This will be available as a free update to existing users of Avid Scorch as soon as Apple approve it for sale on the App Store. Thank you Tom for taking the time to inform me. The Scorch App for the iPad is an excellent teaching aid, and I can see it has great potential for further development. Printing using AirPlay and WiFi would be especially useful. I eagerly await future announcements. coming back for a lot more reading through and commenting here soon. “Avid Scorch for iPad in the classroom | Having nothing to say and saying it. not help but wait to read through much more of your articles. up and let you know a few of the images aren’t loading correctly. I’m not sure why but I think its a linking issue. I have a new Ipad Air 2 as well as Avid Scorch. I can’t get sound to play. Can you help ? more about your article on AOL? I need an expert in this area to resolve my problem. взлом переписки вайбер	– Как взломать переписку viber, Как взломать переписку viber.